Birds' B-Series Sport Suspension Kits for the BMW M235i and M240i consist of specially valved Bilstein shock absorbers and bespoke Eibach springs designed by Birds to offer the ultimate improvement in BMW ride quality and handling on the UK's diverse roads. With the help of suspension experts and professional drivers, we took it upon ourselves to develop a suspension kit that handled beautifully on UK roads while improving the dreadful ride quality. After over 18 months of extensive development and testing, we released the final B-Series Sport Suspension kits for all current BMW 1, 2, 3, 4 Series models, inlcuding the F22 M235i and M240i. Here are some of the reviews of our F20 M235i, including comments on our B-Series Suspension kit. To see all editorials click here, and customer testimonials here. "Not only was the ride quality better than before, ultimate body control improved on our bumpy B-roads and the steering feel improvements were in a different league." "Without exaggeration, the B2 conversion is transformative. There’s more composure in the ride quality and the uprated suspension is much better equipped to deal with uneven roads." The M235i comes as standard with Drive Performance Control which provides a range of driving modes from Eco Pro through to Sport+. 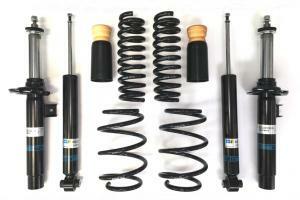 It can also be specified with electronically controlled adaptive M Sport dampers.